One of the most humanist of directors, Kore-eda has created numerous affecting personal dramas (including “After Life,” “Nobody Knows” and “Still Walking”) which touch on troublesome family dynamics, the unpredictability of life, and the immutability of time. His best film, 2013’s “Like Father, Like Son,” tells the emotional story of a father who discovers that the son he’s raised was actually switched at birth at the hospital, leading to challenging decisions about his role as a parent, and the ethical minefield of potentially exchanging one boy for his real flesh-and-blood who’d been raised by others. 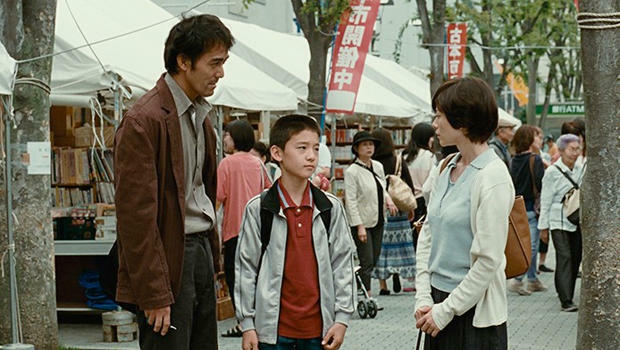 The responsibilities of fatherhood, and fending off feelings of personal failure, are at the heart of his latest film, “After the Storm.” Ryota (Hiroshi Abe), a once-promising novelist, is reduced to working for a detective agency, rationalizing his surveillance of cheating spouses as research for a new book. But he is gambling away the time he could be spending with his son, after his wife, Kyoko (Yoko Maki) has divorced him. Soon Ryota is trailing her, effusive with questions to his son about the new man in her life. But while ever-insufficient money is at the root of his deadening lifestyle (his gambling habits, and distaste for selling his talents to a manga publisher don’t ease those problems), Ryota is also struggling with the memories of his recently-deceased father, a gambler whose apparent diffidence towards Ryota colored his life. As Ryota engages in surreptitious tugs of wars with his sister (over money or personal responsibility), he rethinks his relationship with his parents, and begins to hope that his family might be made whole again. Time -- as both a measure of ambition and legacy (“Men pay too much attention to expiration dates,” one character muses, about men’s obsessions over both women and mortality) -- is brought to bear in Ryota’s short, scheduled meetings with his son. And so is space; the distance between the two seems insurmountable. But when a violent storm keeps these individuals in close quarters, their defenses peel away, and possibilities for new beginnings suddenly emerge. In this quiet and gentle film, the actors are consistently spot-on in unraveling the relationships between husband and wife, parents and children, which tend to define us no matter how much we resist. “Life is simple,” says Ryota’s mother, Yoshiko (an excellent Kirin Kiki), astonished at the wisdom of her own simple phrase. In what should come as no surprise, Kore-eda manages to turn a simple story into something deep, with resonance and heart. “After the Storm” (distributed by Film Movement) is now playing in select cities, including New York City, Los Angeles, Pasadena, Calif., and Toronto, and will open later this month in San Francisco, Boulder, Washington, D.C., and elsewhere. In Japanese with English subtitles. Not rated. 117 mins. To watch a trailer from “After the Storm” click on the video player below.